A Celebration of Life for Katherine Ann Fast of Warroad, MN will be held on Friday, September 14, 2018 at 11:00 am at the Woodland Bible Church. Visitation will be held on Thursday September 13, 2018 at the Helgeson Funeral Chapel, Warroad 5:00 to 7:00 pm. Kathy was born in Langdon, ND to John T. and Katherina (Tina) Fast on February 7, 1936. The family moved to Warroad in 1939, where Kathy graduated with Valedictorian honors from Warroad High School in 1954. After graduation she did light housekeeping in Baudette before she moved to Hastings, MN, where she worked at Smeads Office Supply Factory. Upon returning to Warroad, she was employed doing general secretarial duties for Art Malmberg, local tax accountant. In 1957, she moved to an office position with Marvin Window Company. She retired from her duties at Marvin Window Company in December, 2013 after 56 years of service. Kathy peacefully passed away on Saturday, September 8, 2018. In the 2 months prior to her death, her nieces and nephews had the unique opportunity to reconnect and bond with Kathy. They enjoyed many hours reflecting on family history and Kathy’s wit and charm. Her faith in her Lord was unwavering which helped her in her journey through life. 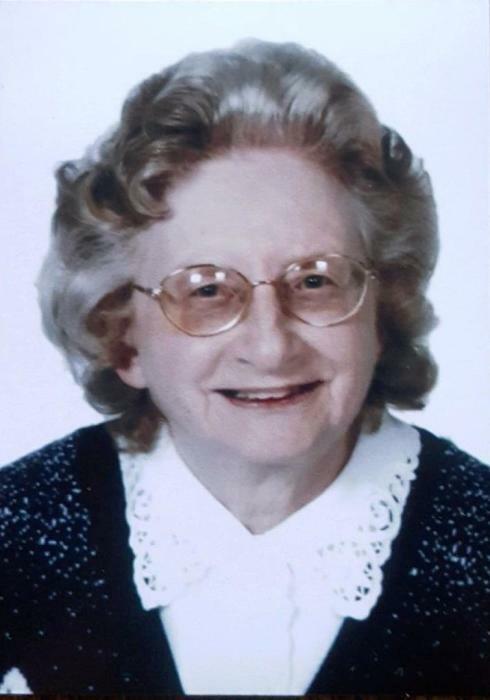 She served as Church Librarian, Sunday School Teacher and preparation of Church Bulletins for many years. Kathy was very supportive of Missionary work and corresponded with many different missionaries. Kathy had a very positive attitude about Life and everybody in it. She made friends quickly and will be missed by new and old friends equally. Kathy enjoyed traveling with Luella Thiessen throughout many Western states and Canada. Those travels included Yellowstone, Glacier and Grand Tetons National Parks. Kathy enjoyed Sunday lunches after Church at the Diary Queen in Warroad. Lunch companions included Alva Larson and Carol Krahn. Kathy enjoyed gardening and appreciating other gardens. She especially liked flower gardens. Kathy’s other passions were reading and embroidery. She acquired many books during her lifetime and loaned out her personal library to anyone who wanted to read those books. She embroidered baby quilts for each grand niece and nephew. Kathy was preceded in death by her parents, brother Don and sister Magdelina. She is survived by sister-in-law Adeline Fast Janzen (Brainerd, MN), niece Bonnie (Greg) Nygren (Brainerd, MN), nephew Craig (Janelle) Fast (Big Lake, MN), niece Carole (Glen) Roseen (Wyoming, MN), 6 grand nieces and nephews, and 5 great grand nieces and nephews.